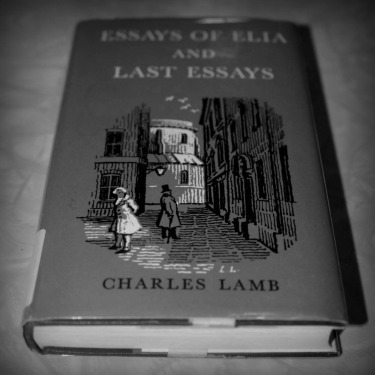 Charles Lamb, Essays of Elia and Last Essays. Oxford University Press, World’s Classics Series; 1961, UK. A hard-to-find little book that sits happily in the palm of my hand and which I would very much like to steal from the library. I am allowed to renew my borrowing period three times before I have to return it. Then I wait a few days and check it out again, and so even if I don’t own it I have the pleasure of its company almost all the time. The soft salmon-colored dust jacket with the black and white print on the front cover is exquisite. I like to think the situation more dire with the present shift from books to so-called e-books. It’s certainly weirder. We see that the disembodiment of books is part of a broader cultural retreat toward immateriality. Books, like musical recordings, photographs and so many other things, will cease to be physical objects at all and will exist only as electronic phantoms, passed from device to device but never from hand to hand. The notion that this makes an improvement on the old order is laughable. It smacks of annihilationism: one more milepost on the Manichaean march toward the final ghostification of all things. I don’t intend to purchase an electronic reading device. I want to insist on the codex. It’s not only that I’m a sentimentalist, but I think we owe philosophical allegiance to the materiality of things. I don’t want a platonic beatitude. I want a real book in my hand, a hot cup of tea, a ‘friend’ I can physically embrace. They fool themselves who believe that digitalization better preserves texts (or recordings or images) against the depredations of time. Some day the dark ages will come again and we’ll see that nothing is saved by being made intangible. Materiality is the only condition of salvation. Consider this series a sort of scrapbook monument to the codex. There’s irony in the bloggish venue, I know. It can’t be helped. But I want to honor books as discrete physical objects. In each case I’ll offer a photograph (or two) and description of a particular book. It need not contain great literature between its covers. It need only give pleasure to the reader or possessor of it. The Mole saw clearly that he was an animal of tilled field and hedgerow, linked to the plowed furrow, the frequented pasture, the lane of evening lingerings, the cultivated garden-plot. For others the asperities, the stubborn endurance, or the clash of actual conflict that went with Nature in the rough. He must be wise, must keep to the pleasant places in which his lines were laid and which held adventure enough, in their way, to last for a lifetime. Mole had to leave home before he could see that it really was home after all. Maturity presents itself as the acceptance of finitude, a shutting of the eyes against (in Updike’s words) “the immense tinted pity, the waste, of being at one little place instead of everywhere.” And yet it’s distance, of the mind or the body, that fosters delight. The art and scope of others are always foreign countries, but while travels abroad may be enriching, the richest moment in any journey is to first turn your eyes toward home again. When we brought last year’s fir tree into the house the kids leapt into a spontaneous heathenish dance around it, stomping, clapping and hooting with abandon. Watching them, though it doesn’t snow here, I smelt snow; and though we have no fireplace, I smelt fire. All at once I was very old and very young and I could have sworn the living room was lit only by moon and stars. It was a significant moment – but whether honoring of pagan survivals or the Incarnation, I wasn’t sure. This year the children found their moment at the St Lucy’s tree lot. It was dark and raining but the fenced off square was strung with lights. Their mother picked out a tree while I kept them from trouble. My son marched stiffly for the taller stands deep in the makeshift woods. My daughter in her red lumberjack’s hat fled giggling through spruces and pines. I walked between the trees calling out for them, thrilled at the scratching needles on the backs of my hands and the sharp smell of sap and the rain running down my neck. Certain years, when I was a boy, we would drive on Christmas Eve to Yosemite Valley, which is nearly deserted in winter. We would crunch through snow up a trail to stare at waterfalls frozen to thousand-foot cliffs like the long hoary beard of Father Christmas. Other years, we would drive to my maternal grandparents’ home near San Luis Obispo. My tall jovial grandfather would play Johnny Cash records and burn sanded bowling pins in the fireplace. Christmas dinner stretched on forever. Seated at the table with the adults, a surplus of holiday delicacies at hand, I could only think impatiently of the enjoyment of new toys. The moment of the feast would spread out to fill the whole night, the whole house, and all the hills and shores and days and weeks in every direction. What was I now? I wondered. Was I an old man yet, like grandpa? Or was I still a boy? What made Stubb such an easy-going, unfearing man, so cheerily trudging off with the burden of life in a world full of grave-peddlers, all bowed to the ground with their packs; what helped to bring about that almost impious good-humor of his; that thing must have been his pipe. It was Ahab’s discarding of his pipe – his inability to take pleasure in it – that prefigured his doom. Never trust a man with no observable vices. The smoker, the drinker, the gambler are all seasoned to an easy, fraternal sympathy. The abstinent, the strict, the grimly ascetic man is a monomaniac in embryo and no lover of mankind. “What’s that noise?” I asked. There was a sound like metal springs released somewhere behind the wall. The nurse said it was just the music. Not the music, I said, something else. Didn’t she hear it? No, she didn’t. She left the room for several minutes. When she came back she stepped toward me and – without a word – made a mark on the left side of my forehead with a black felt-tip pen. I hadn’t expected that. I didn’t know what to say. The mark, I gathered, was intended to show the doctor which eye required surgery. Apparently, the nearly marble-sized cyst in my eyelid wasn’t enough to give it away. My confidence suffered a minor blow. One wants to believe in the skills of someone shortly to wield sharp instruments near one’s eyes. When the young ophthalmologist came into the room I asked if this was a procedure he performed frequently. “It’s a fairly common complaint,” was all he would say. The anesthetic injection to the eyelid hurt. I worried for a moment that he had skewered my eyeball with the needle. Then he applied the clamp to my upper lid, tightened it, and turned the lid inside out. I realized with a start that the music piped into the room was a Beethoven piano sonata. At least, I thought, it’s not the Ninth. I observed from millimeters away as the doctor made an incision with his scalpel. “It’s draining now,” he announced. From my reclined position in the examination chair, the doctor was standing at my left. A comical rumbling sound came from the direction of his stomach. “Doctor L?” I said. Yes? “Haven’t you eaten lunch?” He apologized and explained that he’d just finished a mocha. Mochas always did that to him. Then he used a miniature melon-scoop to scrape out the inside of the exploded oil gland in my eyelid. Finally, he cauterized the wound. I smelt myself at the stake. It really is a pity that he hasn’t got a Twelfth Century at his disposal. My ophthalmologist will introduce me to his twelfth century later today when he removes a chalazion cyst from my left eyelid. I made the grave mistake of watching a video clip of the procedure, which brilliantly combined memorable scenes from A Clockwork Orange and Un Chien Andalou. My pain threshold is nothing exalted and I won’t get more than local anaesthesia. But who could pass up the chance for a little time travel? My six-year-old son wants to know. That’s Frances as in Bread and Jam for Frances and A Bargain for Frances. “Is she younger or is she older than me, do you think?” He’s thinks she must be younger but it’s hard to tell with badgers. When we were kids in the late 1970s, my brother and I would sometimes stay overnight with our paternal grandparents. We’d play Uncle Wiggily and eat ice cream and watch Lawrence Welk and Hee Haw. Afterwards, my grandmother would read Curious George or Frog and Toad or Frances stories to us. I liked the Frances books. The blues and pinks and yellows in Lillian Hoban’s illustrations were so soft and nicely faded. The wordplay and diction was unlikely, as if the stories had been translated from some other language into our own. I wasn’t concerned with Frances’s age. But I never could tell if she was, in fact, a girl or an effeminate English boy in the style of Christopher Robin.